The pound also strengthened against the dollar and euro, while Wall Street's rally continued for a second day. Some investors say last week's sell-off was overdone, while others are betting on central banks to rescue the global economy if needed with more stimulus. "It never was the end of the world," said strategist Jeff Weniger. The senior portfolio strategist at BMO Private Bank in Chicago. said: "To have these kinds of reactions was ridiculous." The FTSE 100 share index closed up 3.6% at 6,360.1 after a flurry of last-minute trading. 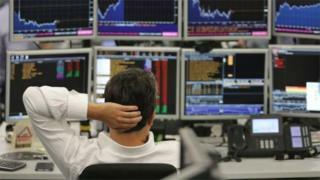 At the close of trade on Thursday last week, before the referendum vote, the FTSE 100 ended the day at 6,338.10. "The plethora of bargains on offer, plus a welcome period of calm in the UK/EU relationship has provided the opportunity for markets to recover in impressive fashion," said Chris Beauchamp, senior market analyst at spread betting firm IG. he added. However Joe Rundle, head of trading at ETX Capital, warned reality was likely to bite soon. "What we're seeing in the FTSE is hope in Britain being able to ride it out by remaining part of the single market. This looks like wishful thinking." The FTSE 250 - which contains more UK-focused companies - closed 3.2% higher on Wednesday, but still remains more than 7% below its pre-Brexit level. Germany's Dax index ended the day 1.8% higher while France's Cac 40 closed up 2.6%. Will more of us take our holidays in the UK? The pound rose 1.2% against the dollar to about $1.35, although it also remains well below levels reached before the referendum. The pound had risen as high as $1.50 on Thursday as traders anticipated a 'Remain' vote, but by Monday it had plunged to a 31-year low against the dollar. Sterling rose 0.8% against the euro on Wednesday to €1.2159. Before last week's referendum it had been trading around €1.30. On Wall Street, the Dow Jones index rose 1.64% and the broader S&P 500 was up 1.7% in the strongest two-day rally since February. The indexes have recovered more than half the losses suffered last week after the UK's referendum vote. Shares in Asia had also posted gains. Michael Hewson, chief market analyst at CMC Markets, said investors had been reassured by hopes that Britain's EU exit wouldn't happen immediately, meaning the status quo was unlikely to change in the short term. "Whilst that doesn't remove the uncertainty with respect to the eventual outcome, it also means that markets are going to have plenty of time to settle into their new-found reality and equilibrium," he said. But Adam Jepsen, founder of Financial Spreads, urged caution: "Any investors who think the markets have calmed down should think again. It is far more likely that we are in the eye of the storm." Shares in the UK's financial sector - which had been particularly hard-hit in the wake of the referendum - continued to recover, with Prudential up 5.5% and Barclays 4.9% higher. The increases came despite credit rating agency Moody's cutting its outlook on the UK banking sector to "negative" from "stable" late on Tuesday. Moody's also downgraded its outlook on the ratings of a number of UK banks and insurers. After losing some ground on Tuesday, the price of gold rose 0.4% to $1,317.75 an ounce. Gold is viewed as a safe asset in times of uncertainty and the price of the precious metal hit a two-year high on Friday in the wake of the referendum result. Government bonds are also considered safer investments. Continuing high demand since the referendum meant the return on 10-year UK government bonds remained close to Monday's record low, when the yield dropped below 1% for the first time.